Julie Pura lives in very humble circumstances in the Philippines. She is a bag weaver and the mother of six children. One of Julie's daughters had a bad skin allergy which required expensive medication. Because of this, the family did not have enough money to buy both food and medication. As Julie was not able to sell enough of her beautiful bags to help provide for their needs, she and her husband decided they had no choice but for Julie to leave the country and seek employment as a foreign domestic worker. This is a path that is very common for desperate women in the Philippines. Elevita found Julie just as she was about to apply for a passport. It broke our hearts to think of her leaving her family. We looked at all of her beautiful bags and chose three of our favorites, ordering just 30 of each as a start. As is our practice, we paid her half the money as a down payment for her work. With this money, Julie had enough not only for the bag supplies, but also money left over to cement the dirt floor of her hut. MIRACULOUSLY, with the improved living conditions, her daughter's skin allergy disappeared. This freed up the family income for food and other necessities. Julie was even able to hire other needy women to help her finish the bags. This is a great anecdote about how simply purchasing a few handicrafts can change the life of a family. At Elevita we had an extremely busy summer working with new artisans and moving across the globe. We also had the opportunity to donate backpacks for impoverished school children in Cambodia. 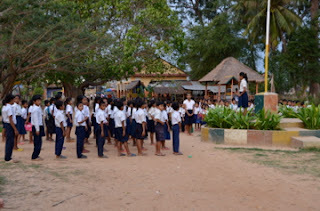 Through the help of an organization called Caring for Cambodia, these children who previously had virtually no education are now receiving two meals a day and a quality education in newly constructed buildings. The girls who received them are very grateful for new backpacks from Elevita! Recently, Elevita Cofounder, Kirsten Monson, and Elevita Volunteer, Cami Bruschke, traveled with their families to Siem Reap, Cambodia. While there they were able to meet with a group of local women to discuss goods they could produce for Elevita. Elevita was motivated to help these women, as many of them live in impoverished circumstances without electricity or running water. These women had many marketable skills, including the ability to make gorgeous silk ties and bags, but many of them who knew how to sew had no sewing machine or means to produce the items. With the help of some donations from good friends, Elevita was able to purchase for these women both a sewing machine and a serger. They will keep the machines in a common community place so they can all have access to them in their free time. Now that these women have been enabled to use their skills, Elevita is looking forward to carrying many of their products in the future. In a country where $20 can feed a family of 5 for 3 weeks, the supplemental income these women can earn by selling their products to Elevita will go a long way toward helping their families. One of Elevita's great successes is told through the story of Melody Cajumban from the Philippines. She was born as one of 11 children of a humble woodcarver. Melody is now a single mom of two children from a turbulent marriage. In addition to helping support her younger brothers and sisters in their studies, Melody uses all the resources she can acquire to provide for her children's physical and educational needs. To do this, for a while Melody ran a fruit stand. But she came upon difficult times and ran out of capital to continue the stand. This is when Elevita found Melody. Melody now makes gorgeous Gold Wire Ornaments for Elevita. Her ornaments have sold so well that by December 2011 Melody had enough capital to reopen her fruit stand. Melody was also able to buy her children some new clothes for Christmas. In this way, Elevita helped Melody not only provide for the basic needs of her family, but also helped her fund her own small business. Elevita recently received a message from Melody's son Roxford saying, "Because of your help, we can eat a delicious food on our table. Thank you!!!" and yet another message from her daughter Roxanne, saying, "Thank you for supporting my mother's small business. It will help us a lot to buy our school needs. My mother is trying to look for some ways to continue my studies...I am assured now that we can pay our school miscellaneous fees and my [6th grade] graduation fee. Thank you!!!" But the story doesn't end here. In the most recent correspondence Elevita received from Melody, she said, "GOD never leave me alone in my struggles. i am so grateful that you found me. i am extremely happy!!! my tears are falling and i dont know why. realizing how blessed i am...i have able to give a job for an out of school youth 16 year old boy." Melody's story reminds us of the ripple effect of helping people in developing countries come out of poverty. Success of one person in a village leads to more resources for the community, and before long many people benefit from the improved local economy. No doubt we will hear more good news in the future from Melody and her associates. In the meantime, Elevita will continue to search for other skilled artisans who simply need a market opportunity for their quality goods.